Ever since the Nobel Prize was awarded in 1998 to three American scientists, Dr. Robert Furchgott, Dr. Louis Ignarro, and Dr. Ferid Murad, for their discovery of how nitric oxide is absolutely vital to health and specifically protects the cardiovascular system, there has been a tremendous buzz in health circles about the amino acid, l–arginine because: arginine is the sole dietary source of nitric oxide. The health and wellness value of l-arginine supplementation boils down to the fact that nitric oxide (from l-arginine) acts as a signaling molecule to help blood vessel linings and underlying muscles to function correctly so that they are elastic, smooth, integral, slippery and able to expand and contract to efficiently pump blood throughout the body. When all of this occurs correctly, plaque is far less likely to adhere to them. 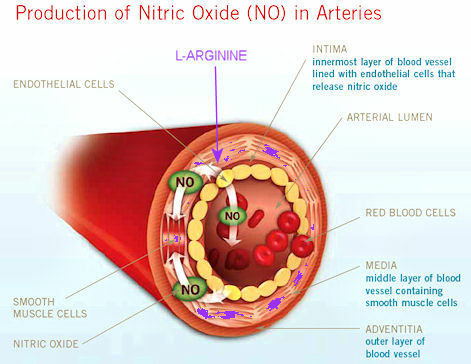 Even when arterial linings have been damaged and become inelastic to some degree (a primary cause of high blood pressure and cardiovascular events), nitric oxide release from arginine will begin to restore proper function of endothelial cells (cells of arterial linings). This assists arterial walls towards becoming elastic, smooth, integral, slippery... and healthy once more. Additionally nitric oxide from arginine functions to keep blood cells from clumping together. It does this better than aspirin (and without the gastrointestinal irritation side-effects of aspirin). Additionally, nitric oxide from arginine helps to kill bacteria that irritate arterial linings and lead to plaque formation. A prime example of Arginine-derived Nitric-Oxide supplementation benefit research can be seen in the pictures to the right — showing results from an experiment where rabbits were fed a high cholesterol diet for 12 weeks. Half of the study rabbits were fed Arginine (in their water), and half were maintained as controls. Pictures of their arteries were taken afterwards. The study concludes that “Arginine completely blocked the progression of carotid intimal plaques, reduced aortic intimal thickening, and preserved endothelium-dependent vasodilator function.” From the Institute of Clinical Pharmacology (R.H.B., S.M.B.-B., L.P., M.B., J.C.F.) and Departments of Cardiology (R.P.B., A.M.) and Pathology (R.N. ), Medical School, Hannover, Germany. The bottom line is that the amino acid, l-arginine, furnishes the best natural protection possible from cardiovascular events related to plaque buildup and hardening of the arteries that science has uncovered yet to date. If you wonder why this discovery isn’t discussed that much by medical doctors, you have to keep in mind that their focus is almost completely on drug based interventions. The health professional that is more trustworthy is a nutritionally versed one. The trick in obtaining this cardiovascular protection plus other benefits of nitric oxide is getting large dosages of five grams or more of free, elemental l–arginine. Lesser dosages do not provide the improvements in arterial elasticity that is so important in terms of cardiovascular protection. Note, that when our endothelial cells are damaged, it can take several months of arginine supplementation to restore the proper functioning of these cells. Arginine is a common amino acid present in virtually every food. One would think, therefore, that getting at least five grams of l-arginine shouldn’t be very difficult. Unfortunately, it isn’t that simple. In fact, the amount of arginine assimilated by eating foods is almost unpredictable. The reason foods present a problem in terms of arginine assimilation is that the amino acid lysine (which protects us against viruses) is present along with arginine in virtually all foods. Arginine and lysine compete with each for assimilation. This competition is what causess the problem. Eating both amino acids at the same time means that neither of them will be assimilated very well. To avoid competition between lysine and arginine, arginine rich foods need to be eaten two hours apart from lysine rich foods. For a complete list of free arginine in foods, click here. Due to the difficulty in consistently eating the required amounts of arginine rich foods completely apart from lysine rich foods, many people rely on l-arginine supplements to boost their nitric oxide levels. You can check out our recommendations below under recommended arginine products. Virtually all of the Arginine supplements on the market do the job of increasing nitric oxide in the body, we have decided to recommend one brand in particular because it furnishes the most amount of nitric oxide/cardiovascular reward for the money.